Owls are medium to large birds of prey of the order Strigiformes, the nocturnal equivalent of falcons, hawks, and eagles. Owls have a very typical shape which makes them immediately stand out from other birds. The body is squat and the head is strikingly large and roundish. They have large, forward-facing eyes with a relatively shortened retina and a convex lens, surrounded by a long tube of scleral nodules, the scleral ring. These eyes allow them to see objects spatially and to estimate speed and distance (binocular vision). The eyes themselves are immovable, instead the animals can rotate their heads up to 270°, which greatly expands the facial field. The eyes are protected by upper and lower eyelids, as well as by a nictitating membrane skin that can cover the eye. While other bird species usually have small round ear openings, owls are characterized by slit-like ear openings that are almost as long as the head is high. 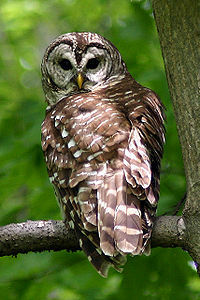 They are also not arranged symmetrically on the head; the right ear opening is somewhat higher, and this asymmetry is variable depending on the type of owl. The part of the brain in which the hearing center is located is very well developed, with as many as 95,000 nerve cells supporting hearing (by comparison, a common crow has only 27,000), with the basilar papilla of the cochlea in the inner ear large relative to the size of the head. What it means is a lateral sound is perceived by one ear a fraction of a second before the other ear, resulting in an extremely acute sense of hearing so powerful they can detect the movement of a mouse and accurately make a kill with the mouse not visible at all, such as under a snowbank or leaf litter. Experiments on barn owl hearing in the early 1970's show they can successfully kill a mouse in one pass while in a room under total darkness. This hearing ability was also the subject of a study to find and correct problems in human hearing. Owls have a large wing area in relation to body weight, with their primary and secondary flight feathers bearing a softened leading edge, allowing for a nearly-silent flight. The feet bear four toes, with the rearward facing toe slightly shortened. The outermost toe is designed as a turning toe and can be turned both forward and backward. The normal position of adult owls is thereby zygodactyl, with two forward and two backward pointing toes. Owls are classified into two main families: Strigidae and Tytonidae. Strigidae consists of nearly 200 living species of what are considered typical or true owls. These birds have large heads with rounded facial disks, and many species bear tufts of feathers on their heads resembling "ears". They range in size from five inches for the elf owl (Micrathene whitneyi) to seventy inches in the Eurasian eagle owl (Bubo bubo) and great grey owl (Strix nebulosa). Tytonidae consists of 16 living species of barn and bay owls, in which the main difference from true owls is a heart-shaped facial disk. The common barn owl (Tyto alba) is the most widely distributed owl species on earth. Owls are found worldwide except in Antarctica. Terrestrial habitats include coniferous, temperate, and tropical forests, grasslands, deserts, and arctic tundra. Owls consume small mammals, birds, reptiles, and insects, with several species specialized in catching fish. Unlike the diurnal birds of prey, they swallow their food whole without tearing, with the indigestible parts (hair or feathers, and bone) regurgitated several hours later. These "owl pellets" as they are called are typically found in the debris beneath nests and roosting sites, giving researchers data into their feeding habits as well as how they control a given animal population. Due to their nocturnal presence, eerie calls and striking skull-like faces, owls have often been associated with death, magic and the macabre. They have often appeared in mythology and fiction as the companions of witches or wizards. A recent example of this is their role in J.K. Rowling's Harry Potter novels, in which owls are kept by trainee wizards as pets, but also used for postal delivery. Owls are also traditionally associated with wisdom. The Greek goddess of wisdom, Athena, is often pictured with an owl. This page was last modified on 26 September 2018, at 13:58.